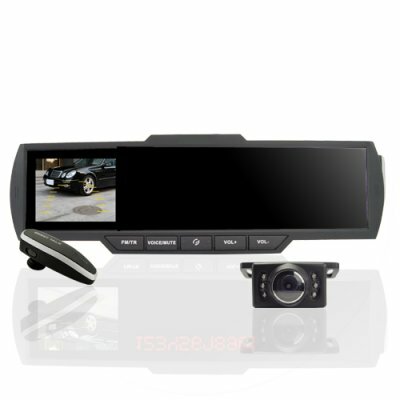 Successfully Added Bluetooth Rearview Mirror Monitor + Camera and Sensors to your Shopping Cart. This all in one handsfree Bluetooth kit with parking camera and sensor set is a level above the rest. Installation is a snap - the rear view mirror just clips on, the camera is stuck or is screwed on, sensors are inserted in your bumper (snugly with no error thanks to the included holesaw) and all the wiring can be hidden out of sight under the dash and in upholstery lining. With this simple set up out of the way your car will be transformed into a safe communications super center. Make calls while driving, use the detachable Bond style earpiece for privacy and reversing or get into tight parking spots with ease. The mirror houses an internal LCD for caller ID, as well as the monitor for reversing guidance complete with handy reticle. A speaker is also included to guide you in and will give indication of the distance to the nearest rearward obstacle from 2m to .3m in steps of 10cm. When you get to close"stop" will repeated. Another great product to make life on the road a lot safer, brought to you at super prices from Chinavasion. The picture of the number on the internal LCD of the rearview mirror below is for indication only..
- Audibly Counts Down from 2 Meters to .3 in increments of 100mm @ 300mm the voice will say STOP repeatedly.